We report a case of neutropenic ulceration in a 42-year-old woman receiving azathioprine for pemphigus vulgaris. She developed multiple indolent ulcers involving the nose, neck, and back, after about 6-8 weeks following commencement of azathioprine 50 mg daily. The ulcers were large, disfiguring, dry, and with basal necrotic slough. They were painless and did not discharge pus. The absolute neutrophil count was severely depressed initially, but normalized following azathioprine withdrawal. Swab culture revealed colonization with Klebsiella pneumoniae and the ulcers healed with local debridement, treatment with imipenem, and topical application of mupirocin. However, nasal disfigurement persisted. Neutropenic ulceration is known to be associated with azathioprine therapy but we report this case because of the unusual presentation-indolent cutaneous ulcers. Early recognition of the problem and drug withdrawal can prevent complications like disfigurement. Neutropenia is characterized by an abnormally low number of neutrophils in the blood. Neutrophils normally comprise 45-75% of circulating white blood cells, and neutropenia is diagnosed when the absolute neutrophil count falls to <1500/ μL. Slowly developing neutropenia often goes undetected and is generally discovered when the patient develops sepsis or localized infections. There are many causes of neutropenia, and immunosuppressants are a common iatrogenic cause. Azathioprine is an immunosuppressant drug that is being used for nearly 50 years now in organ transplantation and in diseases with suspected autoimmune etiology. Dermatologists use azathioprine as a steroid-sparing agent in various dermatoses such as psoriasis, immunobullous diseases, photodermatoses, and eczematous disorders. The drug has been used in ulcerative autoimmune disorders such as Crohn's disease and pyoderma gangrenosum. On the other hand, it has also been implicated as a cause of ulceration associated with neutropenia. Most reports of neutropenic ulceration document involvement of the buccal mucosa and oral cavity. ,, We report a case of multiple severe cutaneous ulcers associated with long-term azathioprine use in a patient with pemphigus vulgaris. 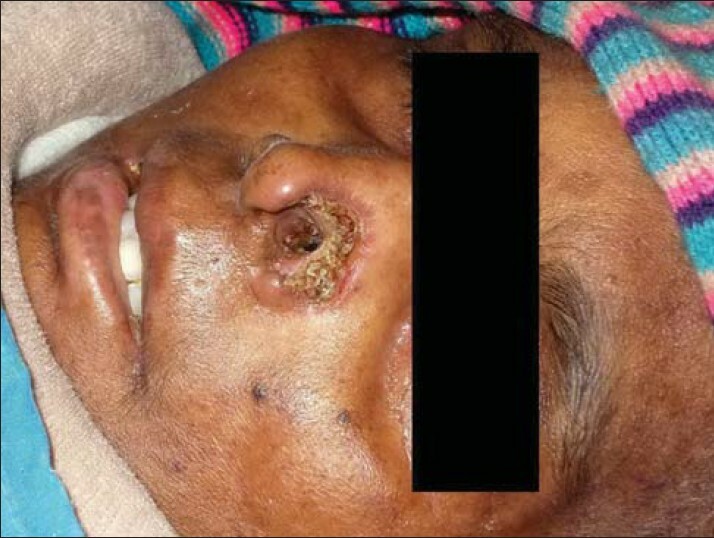 A 42-year-old lady was admitted to the medicine ward of a tertiary care referral hospital with the complaint of multiple ulcers involving the nose, neck, and back [Figure 1] and [Figure 2]. The ulcers were large (over 1 inch in the longest dimension) and disfiguring. The one on the nose had destroyed the left nasal ala. They were relatively painless and did not discharge pus or other fluids. Dry necrotic slough covered the bases. There was no mucosal involvement. The patient had been started on azathioprine 50 mg once daily, 12 weeks before admission, for pemphigus vulgaris. The patient also received a course of oral prednisolone initially. The dosing details of this were not available but the patient recalled that this was withdrawn after two weeks, whereas azathioprine was continued in the same dose. The bullae resolved within 4-6 weeks of starting therapy, but the ulcers started developing subsequently. They were small to begin with and had deteriorated sharply within the past 7-10 days. She had no history of diabetes mellitus, other autoimmune diseases, or other comorbidities that may be associated with immunosuppression, and was not on any other regular medication. 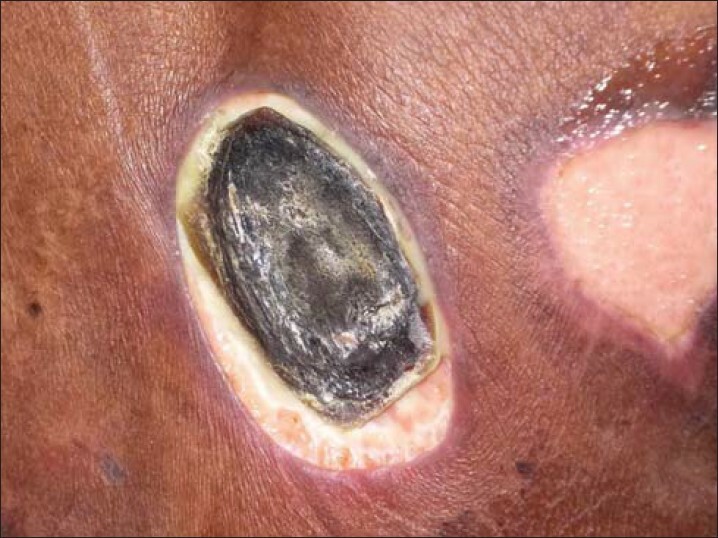 She had tried self-treatment of the ulcers with topical antiseptics, including povidone iodine, without success. Neutropenia was suspected and her absolute neutrophil count on admission was 390/μL. Other hematological parameters, blood glucose, and renal and hepatic function tests were normal. Swab from ulcers on the neck revealed Klebsiella pneumoniae sensitive to imipenem. Azathioprine was withdrawn, she was started on imipenem 1 g intravenously twice daily, and the ulcers were debrided and dressed daily. They started healing satisfactorily. A bone marrow examination was contemplated but not done, since the neutrophil count started recovering and had normalized by day 10 after admission. Fungal culture was also not done. Imipenem was withdrawn after 14 days and the patient was advised to apply topical mupirocin thrice daily till complete healing. She was advised not to restart azathioprine and referred to plastic surgery for skin grafting and management of the disfigurement. In neutropenic patients, infections can present in unusual forms, such as without pus formation, since this requires the presence of circulating neutrophils. Neutropenic ulcers are now a recognized clinical entity. , In this case, the clinical presentation suggested neutropenic ulceration and it was relatively straightforward to associate azathioprine, a drug known to cause neutropenia,  with the ulceration, since the patient had no comorbidities and there was no other explanation for the ulceration. The causality category of this adverse drug reaction (ADR) would be probable /likely by both the World Health Organization-Uppsala Monitoring Centre criteria for causality assessment  and the Naranjo ADR probability scale. Lack of rechallenge prevented 'certain' categorization. The unusual features of this case were the lack of mucosal involvement and the indolent nature of the ulcers which was probably why the patient did not seek treatment earlier. The mechanism of azathioprine-induced neutropenia is probably its myelosuppressant action. The enzyme thiopurine S-methyltransferase (TPMT) metabolizes thiopurine medications, including azathioprine. It is known that individuals with both intermediate and absent TPMT activity, due to pharmacogenetic variations, have an increased risk of developing thiopurine-induced myelosuppression, compared with individuals with normal activity. However, no pharmacogenetic analysis could be done which is a limitation in this case. For this patient, the ulceration was not immediately life threatening, but the disfigurement that occurred might have been averted by intervening earlier. In conclusion, it can be said that dermatologists and other physicians need to be aware of the possibility of neutropenic ulceration in patients receiving azathioprine. Early recognition of the problem and drug withdrawal can prevent disfigurement and other complications. It is also prudent to start azathioprine after a basal complete blood count and repeat the blood count monitoring periodically with gradual step-up in dosage if no adverse events are noted. 1. Lo LK, Hung CM, Chen YF, Ko WC, Tsai TF, Chu CY. Azathioprine-induced severe bone marrow toxicity - a report of 3 cases. Dermatol Sinica 2009;27:44-51. 2. Madinier I, Berry N, Chichmanian RM. Drug-induced oral ulcerations [Article in French]. Ann Med Interne (Paris) 2000;151:248-54. 3. Casey C, Brooke T, Davies R, Franklin D. Case report of a family with benign familial neutropenia and the implications for the general dental practitioner. Dent Update 2011;38:106-8, 110. 4. Copete MA, Sheridan DP. Large granular lymphocyte leukemia and its association with oral neutropenic ulcerations: A case report. Oral Surg Oral Med Oral Pathol Oral Radiol Endod 2000;90:474-7. 5. Zakrzewska JM, Robinson P, Williams IG. Severe oral ulceration in patients with HIV infection: A case series. Oral Dis 1997;3 Suppl 1:S194-6. 6. Barrett AP. A long-term prospective clinical study of oral complications during conventional chemotherapy for acute leukemia. Oral Surg Oral Med Oral Pathol 1987;63:313-6. 7. Barrett AP. Neutropenic ulceration. A distinctive clinical entity. J Periodontol 1987;58:51-5. 8. Boonsrirat U, Angsuthum S, Vannaprasaht S, Kongpunvijit J, Hirankarn N, Tassaneeyakul W, et al. Azathioprine-induced fatal myelosuppression in systemic lupus erythematosus patient carrying TPMT*3C polymorphism. Lupus 2008;17:132-4. 9. The use of the WHO-UMC system for standardized case causality assessment [monograph on the Internet]. Uppsala: The Uppsala Monitoring Centre; 2012. Available from: http://who-umc.org/Graphics/24734.pdf. [Last accessed on 2012 Apr 30]. 10. Naranjo CA, Busto U, Sellers EM, Sandor P, Ruiz I, Roberts EA, et al. A method for estimating the probability of adverse drug reactions. Clin Pharmacol Ther 1981;30:239-45. 11. Higgs JE, Payne K, Roberts C, Newman WG. Are patients with intermediate TPMT activity at increased risk of myelosuppression when taking thiopurine medications? Pharmacogenomics 2010;11:177-88.